My E.O.G Game Is On! I think I just level-upped my Early Onset Grumpiness. I dunno which is righter. No. Wait. I know neither is actually acceptable and just give up. The Silver Fox and I are sitting here in our neighborhood cafe, drinking our coffee and discussing Trump denying he used the phrase “shithole countries” the other day when something happened. I’d seen this guy walk up with his dog – a young yellow lab, so I was attenuated on The Fox’s behalf since his dog share is also a lab. The guy ties his dog up street side and comes into the cafe. Anyway, he ordered to go, as it turns out. He’s standing there waiting for his sandwich and the next thing he or I know his dog is in the street greeting a passerby jaywalker. 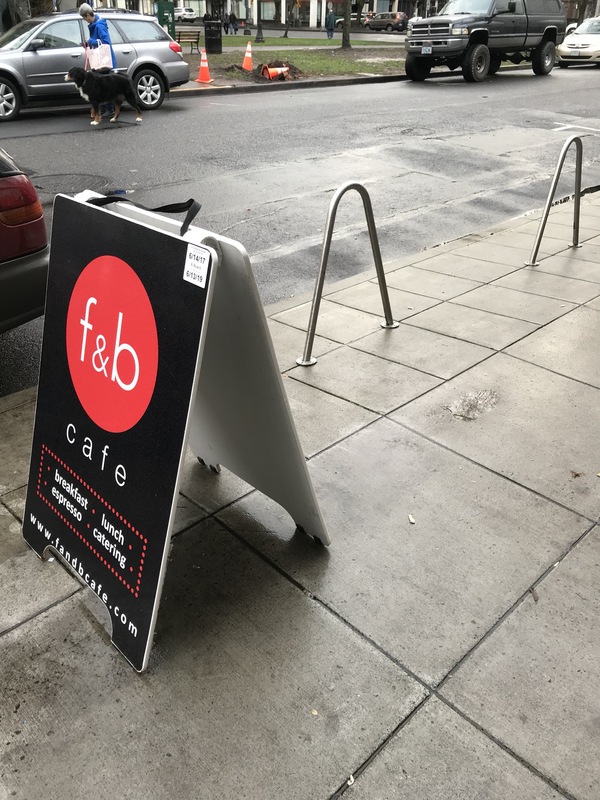 Now, I saw the guy come into the cafe sans puppy and assumed he had been lashed to one of Portland’s many bike racks. No, our brainiac tied the dog to a table that is just a lightweight metal legged, wood slat top situation. Patio furniture, basically. The dog is enthusiastically greeting this jaywalking lady who is trying to pick the tabletop up out of the street and the dog has completely entangled himself in the leash and tablelegs. Not that that is dampening the pup’s enthusiasm at all. The owner finally arrives and handles the dog situation. I wonder if the dog knows the woman, explaining the overwhelming excitement of the animal toward her. She’s now picking up hardware out of the street so cars don’t get screws stuck in their tires. After she’s collected the attaching screws and whatnot, she carries on her way. The guy comes in, picks up his sandwich and leaves. I give him a hard stare as he walks by my window, which he adroitly ignores. I walk up to our Substitute Barista and ask if the guy said anything to her about the table. She’d missed the entire thing, helping customers. Two of whom are standing right by me waiting for food and had seen the entire thing. Neither of them confirm my account, so Substitute Barista and I go outside to assess. The guy had set the detached top back on the legs and left the hardware sitting on the window ledge adjacent. Substitute Barista declares that situation unsafe and I suggest taking the table into the cafe’s storage area. She agrees, I grab the top and she grabs the legs. She’s still talking about how could people do something like that. One of the other witnesses is leaving as we’re coming back into the cafe and holds the door, saying, “Nice timing!” at her helpfulness. I glare at her in disbelief, still she’s said nothing. We went on to discuss the Trumpster Fire’s use of the phrase “shithole countries” some more, specifically how NPR had actually quoted the phrase and not bothered bleeping it. The point I was making was how the mainstream media and congress have largely stood by and not specifically called out Trump for his bad behavior. This is how he is able to continually get away with his devolving statesmanship. Much like the two customers standing immediately by the dog owner today. I watched what happened, stood up, crossed the cafe and narced on the guy who damaged someone else’s property and said nothing. And why should he, given the example of our country’s leadership? Well, I saw something and I said something. When the guy walked back by with his dog as I wrote this, I debated going outside and saying something to him. The Fox kind of talked me out of it, which is good since I may fail the “respectfully” part of the conversation…but I glared at him real good. Some days, like Mr. T, you just wanna slap a fool. The dog and woman in the street bit was worth the price of admission.